Pagham prove lightning can strike... Three times! Storm clouds may have gathered over Nyetimber Lane, but a thundering second half performance saw the Lions record their second league win to remain unbeaten at the start of the season. Early exchanges saw the ball played from end to end, Pagham's George Gaskin & James Thurgar both having chances to get the opener. Lancing's Jack Rowe-hurst could also have scored, and was to be the sharpest of the Lancers' players throughout the game. At the back Ryan Davidson was having a massive game for Pagham, repelling any attacking charge from the visitors. With the rain teeming down, neither side could get a grip on a slippery pitch, and even the Lions' legion of attacking players were unable to break the deadlock. A mostly forgettable first half ended goal-less. The second half began with Pagham making a change, James Thurgar making way for Callum Overton. A corner within the first minute was scrambled away by Lancing, but the Lions did look like they were now showing their teeth. Gaskin had a long shot go just wide, whilst Dan Simmonds took advantage of a Pagham sortie to shoot at Lancing 'keeper Tony Di'Barnardo. Three minutes before the hour, it was Overton who opened the scoring. A scything low shot gave Di'Barnardo no hope as Pagham took the lead. Lancing's Rowe-Hurst was being well marshalled by Pagham's defence, as the visitors tried to find a way passed the Lions back four. A booking for Lions' skipper Jamie Horncastle wasn't in keeping with a tough but fair game for both sides. Both Overton and Simmonds could have made it 2-0 with shots on goal before a superb save from James Binfield denied Rowe-Hurst from a free-kick. 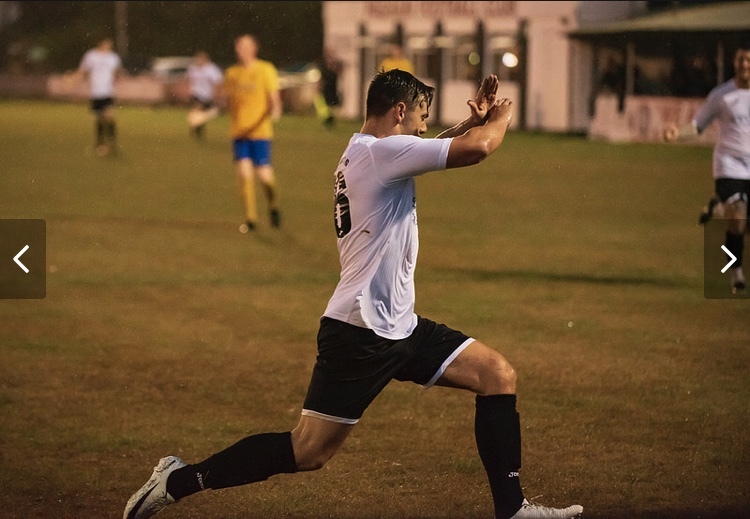 Pagham's second when it came was a lightning strike from Simmonds. As if out of nowhere he struck home on 76 minutes to leave the Lancers looking blunted. Two minutes later and it was 3-0, George Gaskin collecting a Simmonds pass & smashing the ball past Di'Barnardo. With the game all but won, Jamie Horncastle made way for Scott Murfin, as the Lions looked to increase their lead further. That they didn't was only down to some wayward finishing at the end. Next up a trip to K Sports in the FA Cup and on this form Richie Hellen & Tom Simmonds' side should do well. Match report by Jon Rose.